If you were born to a poor family in 1805, do you think you would grow up to be wealthy? If your mother told lies and you turned lies into fairy tales, would you think anyone would think you a genius? If people said your grandfather was "mad" and then children called you "crazy," too, would you want to keep writing stories for them? If people called you "ugly," would you want to appear on the stage? If you didn't know a soul in a strange big city, would you go there to live completely on your own when you were fourteen-years old? If you didn't get to go to school, would you start going to school when you were seventeen? If people didn't like the stories you wrote, would you persevere and even pay to get them published in a book? 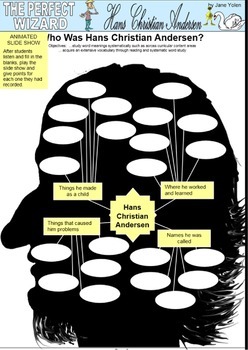 Hans Christian Andersen did all of these things and more! How could someone who experienced so much suffering and humiliation in his lifetime, bring happiness to others? Now you can read his biography in a beautiful picture book by Jane Yolen. At the bottom of each page, you can see a snapshot of one of his stories, inspired by his childhood and his struggles. 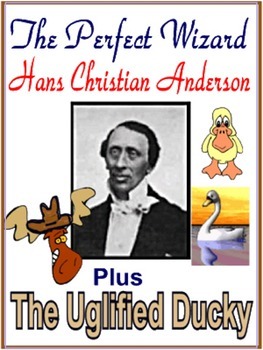 Read about his determination to gain fame and the long road to his genius being discovered. His fairy tales have lived happily ever after in the hearts of children and kings for hundreds of years. He was The Perfect Wizard. 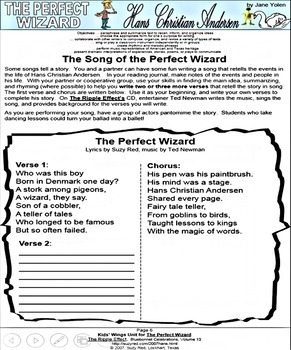 The Kids Wings literature guide was written by Suzy Red and comes to you in both PowerPoint and PDF formats for awesome projection and fast, clear printing.